Product Description-The Classic cat litter tray is a must have product for all cat owners. This is an in- house brand and is made of durable plastic, which makes it extremely easy to clean and maintain it. It comes with a dark grey color rim along with a lighter grey base. 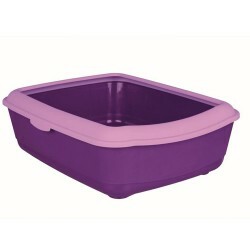 This Trixie litter tray is a must have to maintain hygiene within your household. The Trixie tray is made of durable plastic and is extremely easy to clean and maintain. This is a light weight tray and can be carried anywhere. If you want you can even take it with you when you go for your vacations. The grey colour litter tray will make your travel with your pet a little less worrisome. You need to clean all litter trays on regular basis so place it in an area you and your cat can access easily. The tray should be placed in an area where the cat can locate it easily but can also have his or her privacy when it wants to use it.